As you can see, I've gone a bit OTT with festival clothing and accessories but hey, I've never been to one before and want to experience it to the full, fashion and accessories included. Sorry I haven't gone into detail about every item I've bought like I usually do in my haul posts but I'm currently writing this late at night and I've bought so much stuff that this post would be too long if I added comments after every item. The wellies are a bit of a cheat as I didn't actually buy them with my own money but I did buy them for the festival none-the-less. You might of seen that I recently took part in Matalan's Style Project where I was provided with a £50 voucher to create a festival look so I bought those for that but of course intend to take them to T in the Park with me too. Wellies are a must at a festival so I knew I'd be putting some of my £50 towards a pair and as soon as I spotted these black ones with a brown band around the top, I had to have them. I think they're lovely as they'll go with all of my outfits and they're a bit more stylish than your bog standard khaki wellington boot. I also picked up this cute pair of fringe ankle boots from Primark to wear if the wearhers nice which apparently its going to be. Yippee! As great as wellies are, they're more appropriate for mud and rain than glaring sun so I've made sure I'm prepared for whatever the weather come rain or shine. As you can see I've also bought some pretty items of clothing to wear including a cute aztec cami from Primark, Denim shorts and a playsuit from Miss Selfridge, a tie-dye off the shoulder dress from Missguided and a pac-a-mac from Matalan. I absolutely love them all and think they're all very 'festivaly' so keep your eyes peeled for a festival themed outfit post sometime next week to see how they look. Festival outfits obviously wouldn't be complete without accessories too so I went a bit jewellery crazy in Primark and Matalan. I got three multi-packs of bracelets and super cool 'double ring' with dangly crosses and a chunky tarnished gold necklace from Primark and I also picked up a necklace with cute little crosses from Matalan. My mum bought me the lovely black and gold spiky number for my birthday and my best friend who I'm going to T in the Park with also bought me some lovely festival jewellery from Topshop and Matalan. I especially love the three tier necklace from Topshop with the cross and spikes- so pretty. I feel like I've gone a bit cross mad in terms of jewellery! I also picked up a fringed bag from Primark to keep my belonging safe and lets face it, a festival outfit wouldn't be complete without a bit of fringing. I also got some knee high socks from Primark to wear underneath my wellies. I love the stitching on them, its so cute. Another festival accessory that I just HAD to get is a floral headband. They're all over the place at the minute so when I spotted this pretty one in Primark, I instantly added it to my basket. I imagine it will look lovely with natural messy hair - very boho indeed. Hopefully it will distract from any greasy roots that start to make an appearance towards the end of the weekend too. Eeep, thank god for dry shampoo. Of course I'll be taking lots of other essentials with me like wet wipes, dry shampoo, suncream, hand sanitizer and plenty of beer but this post would go on forever if I told you about all of that! I feel like I'm prepared for anything though and I've even bought a portable iphone charger - check me out. I just need to make sure I don't lose anything now or drop my iphone in a pile of mud. Wish me luck guys! Have you ever been to a festival? Do you like my fashion choices? Love some of these pieces! Love the shorts too! The Primark jewellery looks gorgeous. Loving all the jewellery you picked up! Good choices! I love the jewelry! It's so cute!! The biggest tip I have if you're going to a festival is to buy a really cheap phone, put your sim card and contacts into that phone, the charge lasts so long and if you lose it/ break it, it's not so big of a deal. Then just take a camera with you to take pictures. Definitely saves you worrying about it getting broken or even stolen! And you can save precious battery charge! Your choices are fab, I couldn't of picked any better myself. If a festival isn't your chance to splash out and wear a floral head band, shorts and a mac then I don't know what is!! I love everything that you've bought!! The jewellery from Primark is a bargain I've bought a few of those packs of three bracelets and I love stacking them up on my arm for a real festival feel. Also loving that bag, fringing is my absolute favourite trend right now! I love those topshop bracelets! Love all the jewellery you got!! love it, do you live in Edinburgh?? hahah I'm from Brazil, but living in Edinburgh now.. I love the little primark boots, they're so cute! I'm thinking of doing a festival haul soon as I'm going to reading and I want so much stuff! I'm really lusting after a cute set of dungeree shorts but need to have a proper browse. I love the Primark ankle boots! I want to get my hands on some. I love the Aztec cami and the Primark bracelets! You always find great pieces in Primark! Every time I go in I can't find anything but yet come onto your blog and you have some great finds. The aztec cami is gorgeous! I love all the jewellery! :) these are all perfect festival pieces! Thanks For Sharing! 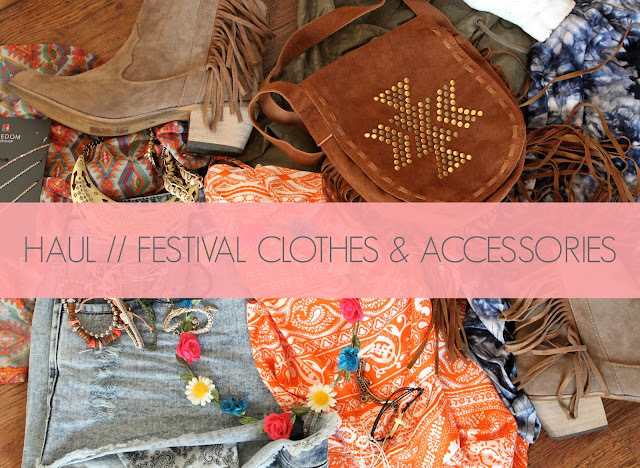 Festival Clothing in Australia. The shirt, shorts, and dress you bought are very cute! 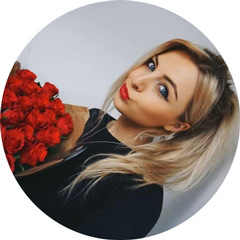 4000 Followers Giveaway ft. MAC, Topshop & More!